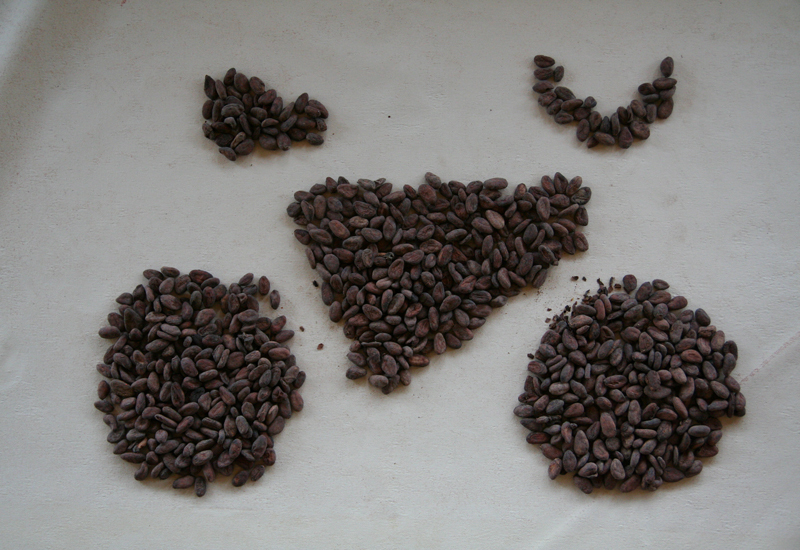 Cacao beans form a symbol of Dan’s dream on the move. Four weeks ago yesterday, I was at the Exploratorium in San Francisco with my family. It was the first day of our two-week vacation. The weather was cool and gorgeous as we trekked to the museum, stopping to picnic near the Palace of the Fine Arts. The Exploratorium was bustling with wonder and discovery, young and old minds alike taking it all in. And then my phone rang. It was my friend Laurence, calling to tell Jason and I that our friend, Dan, had died. Dan had been sitting at our dining room table just five days before, reviewing our recent DIMBY (Dine In My Backyard) event and drawing up plans for the next one. We had also seen him at a dessert potluck just two nights before he died. The news was impossible to comprehend, and was made even more difficult because we were so far from home—we couldn’t witness and participate in the collective shock and grief. A small part of my mind kept whispering: Maybe the grief didn’t exist, maybe the death didn’t happen. But it did, and I have spent the past month trying to process it all. I have both avoided writing anything about it and known that I have to write about it. This is what I do. Writing must be a part of my grieving. In many ways, Jason and I didn’t know Dan all that well. We met him a year or so ago through Laurence, running into him here and there, always diving into lively food-focused conversations. We raved about his bean-to-bar chocolate, confident that his company, Flatlander, was going places in a big way. We knew him simply as Dan the Chocolate Man—a brilliant guy who was brave enough to follow his dreams and make the world better along the way. But on another level we felt like we knew Dan deeply, because we shared his excitement for food and people, and for bringing them together in every possible configuration. It felt like we could see inside his mind and his heart, and we immediately recognized what we saw, the way you recognize an old friend. Just this spring, our friendship shifted from talking to doing. Jason and Dan began putting their heads together, along with Laurence and a few others, around their common food geek status and love for community. The ideas were flowing, and DIMBY was the first expression of those dreams. I lingered on the sidelines until my own enthusiasm spilled over—even more for the idea of strangers sharing a table than for the wonderful food. I dove in, collaborating with Dan who made the ice cream to serve with my peach-thyme upside-down cake at the second DIMBY gathering. It’s really hard to imagine this community without Dan—without his bars of chocolate tempting us in all our favorite stores around town; without his bike zipping down our street daily (Dan was firmly anti-car); without his infectious ideas populating our inboxes. I’m grieving all of that, and I’m also beginning to grasp that I’m grieving death itself—especially death that “makes no sense.” Investigators suspect Dan’s death was a suicide. There is no other explanation that makes more sense, but it’s still hard for me to accept. There was no note or letter, no known struggle with depression, no subtle or obvious cries for help. Dan’s life was packed with friends and a loving family, surrounded by community, and full of plans. In fact, the night Dan died he was at the food co-op buying sugar for his next batch of chocolate. I’ve had to abandon my quest to “make sense of it.” That’s not going to happen. I’m grateful, though, that there is a way for us to make meaning out of what’s meaningless. Dan’s family and friends have established the Flatlander Fund to raise money for a community kitchen, something Dan had talked excitedly to Jason and I and others about. The certified kitchen will be a place for people to gather around food—classes will be taught, demonstrations given, specialty food businesses supported, and, most importantly, meals shared. That’s what we did at Dan’s memorial service. We gathered together as a community, out at Prairie Fruits Farm, and shared a meal that we had made with our hands. This weekend, Jason and I will help cook another meal—one that will gather people together around a table and raise money for the Flatlander Fund. I love what Laurence said at the memorial service and want to end the post with it, trying to believe in my heart that all endings are also beginnings. I think Dan grasped intuitively the magical or miraculous power of food. Remember that Theobroma, the genus to which cacao belongs, means ‘food of the gods.‘ Although Dan set the highest possible standard for the chocolate he made, he was not into food for food’s sake. The power of food lies not in whatever private pleasure it gives but in the communal bonds it creates. When we gather together and share the food we have made, we become communicants. That’s why he loved potlucks like this. In gathering like this, in feeding each other, our community is sustained and created anew. It rises, like a phoenix, from the ashes of consuming its own substance. That was a beautiful expression of emotion. The more I think about it, the more I’ve come to think that Dan’s death was a terrible accident–one of his experiments gone dangerously bad. But maybe, that’s just my mind trying to make sense of it all. Something, like you say, that may never happen. Thanks, and I’ll see you this weekend. This must have been a difficult task, Kristen: trying to write down what is not settled in your own heart. Some things just don’t make sense, though deep down we yearn for reason and explanation to make things right again. What certainties can we have when we know nothing for sure? I’m certain that you and Jason are the better for having known Dan in the last year or so, and that Dan was the better for knowing you. I’m certain that the banquet table now offers yet another flavor–sadness and loss–and that his flavor, too, is truly a part of life. And I’m certain that the Kingdom of God begins and ends in feasting, from when Jesus changed water to wine so that family and friends could celebrate longer, to that eternal day which has been called the Marriage Supper of the Lamb. The table here will be richer and fuller, though incomplete. The table there will be more joyful for the reunion it brings. Many thanks, Kristin, for such a beautiful and thoughtful post, which captures what so many of us have been feeling and go through the past four weeks – four weeks ago this past Monday, when the moon was full again. Not easy to write about, I know. What a tough post to write. Thank you for sharing this with us and for challenging us with Dan’s vision. Todd, thanks for reading, and for being a part of the community that has been blessed by Dan’s life. Mel, it seems that no matter how firmly I tell myself that I can’t make sense of this, my brain keeps sneaking off, trying to do just that. I guess that’s part of the uphill climb. I’m glad you’re here to travel it with us. Ray, the certainties you offer give me lots of comfort. Jason and I certainly *are* better for having known Dan. The table that we share has a new dimension and depth—although we would never have asked for it, we will do our best to commune in its richness. As far as heaven goes, I realize I’m still a bit lost and confused about what to envision and what to expect—how it all “works.” I trust that will sort itself out along the way. Laurence, in jest, I’d like to blame you for introducing us to Dan, but as I said to Ray, our lives are definitely richer because of it. Thank you for all that you do to bring people together in this community, and for your ability to express both our celebration and grief at Dan’s memorial service. As I said to Mel, I’m so glad you are alongside us, pressing on. ed, it’s really exciting to me to think that Dan’s vision might spark ideas in people who care about these things in their own communities. I really hope that anyone who is drawn to the DIMBY or community kitchen ideas will get together with some like-minded people and see what happens. thank you so much for sharing this with the world. i need to be reminded about what it’s like to have passion for something. also, i need to be reminded of how everything & everyone is connected. through the life of dan and your community, you have inspired others. I’m really sorry for your loss and your community’s loss. It’s so hard to make sense of death, but death really is a form of new life. Dan has moved on to new life, and you and your community are creating new life by putting your efforts into the community kitchen project. If that’s not meaning, I don’t know what is. These are the times when platitudes really just have no place. Where cliche and regular words seem to make too small the pain that chokes us. I’m sorry for Dan, for his family, his friends, and for your community. That’s the best I have; a deep and abiding sadness across miles, an understanding that life is hard and messy and it hurts sometimes. Know that your community is loved.